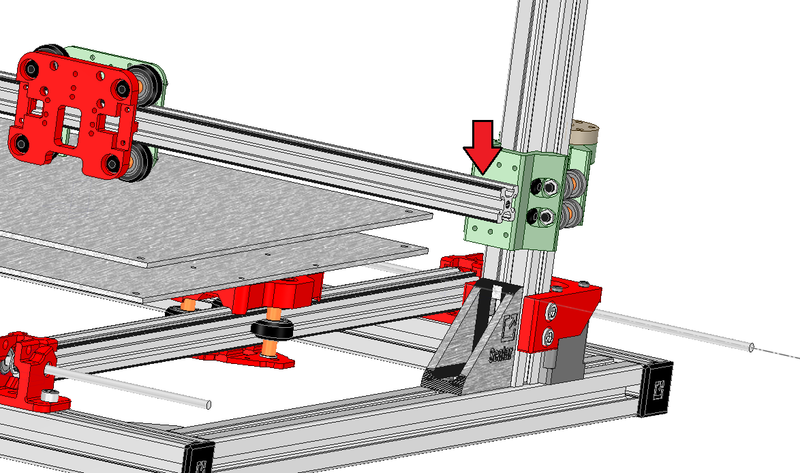 You need to remove the top part of your chassis in order to insert the 2 jaws system previously assembled. 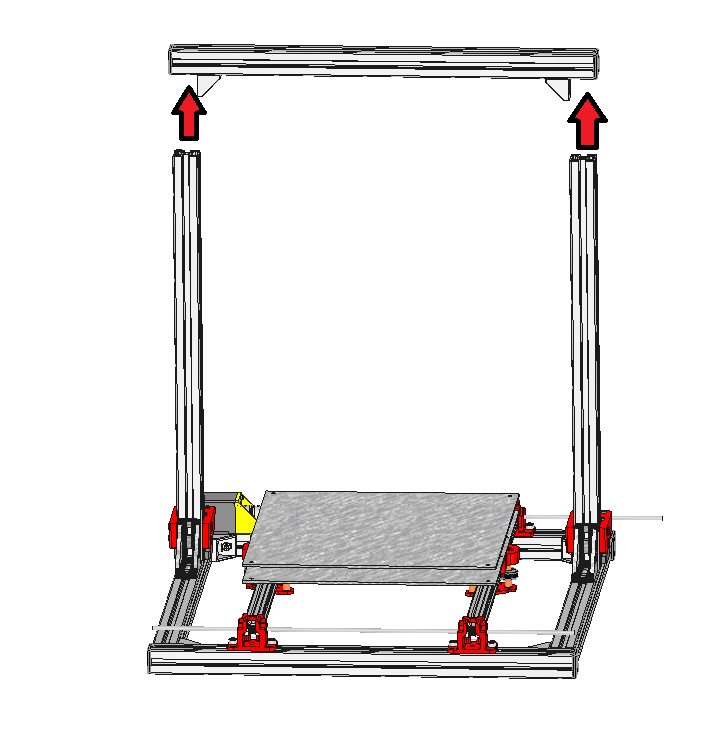 The « Idler » part is to be positioned on the right side. 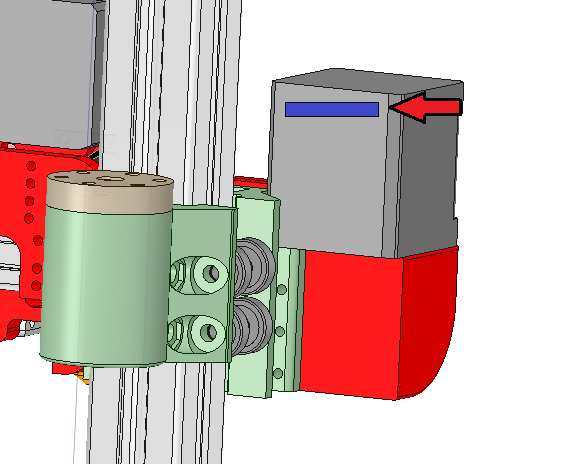 The « Motor holder » part is to be placed on the left side. 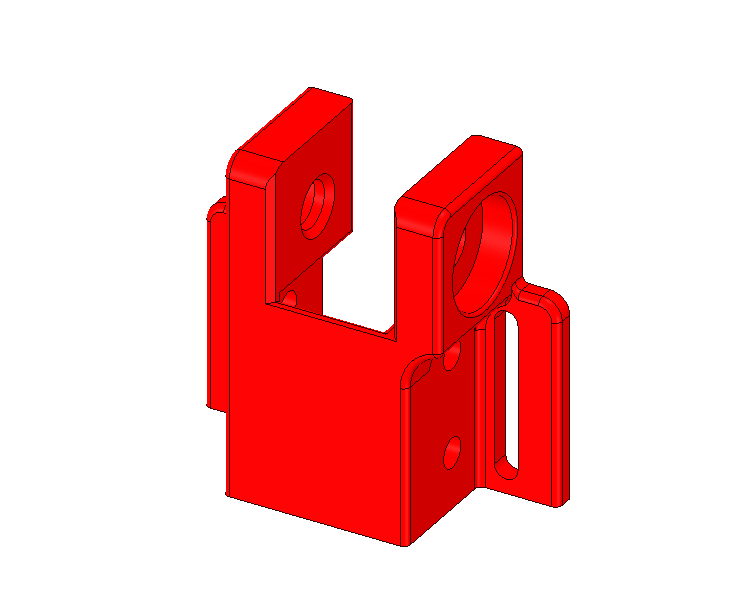 Now that the top extrusion profile is removed, you can insert both jaws on their associated Z extrusion profiles. 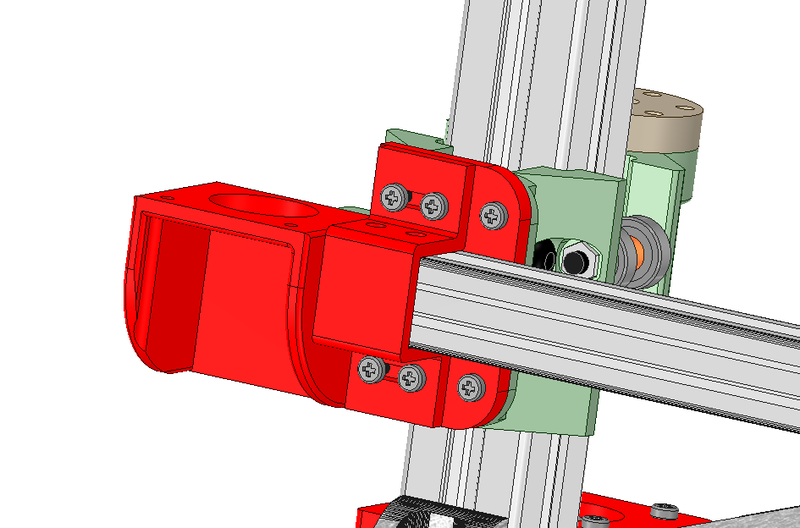 You might need to apply some force in order to make them fit around the extrusion profiles. 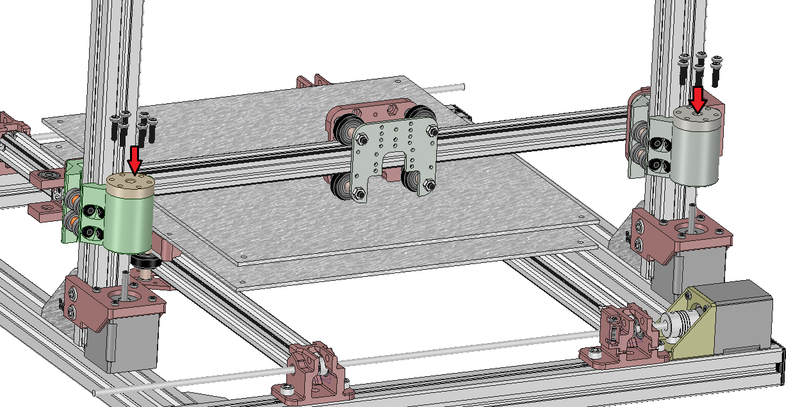 Here is a top view showing that the bearings are in contact with the extrusion profile flat sides. Slide them both down . It might not be smooth when you move them down, but it doesn’t matter as the threaded rod will handle it. 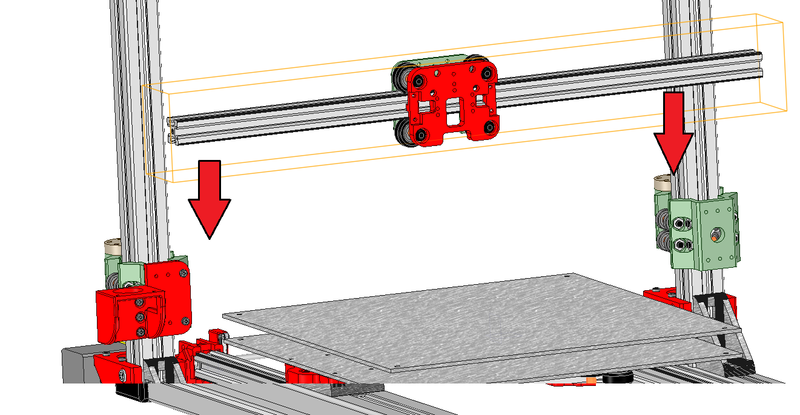 They must be able to slide around the extrusion profiles with no blocking points. 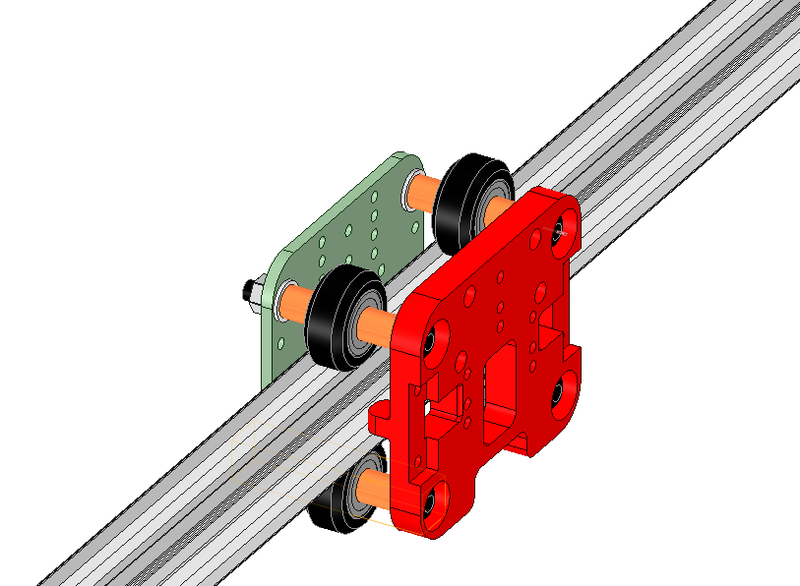 Each wheel is placed in the middle of the whole assembly with 1 spacer and 1 washer on each side. 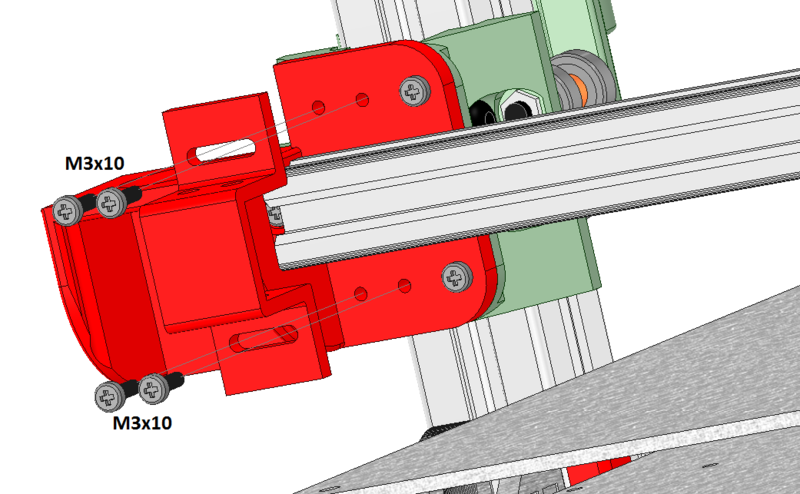 Note The smalls protuberances are to be placed so that they fit inside the extrusion profile groove. 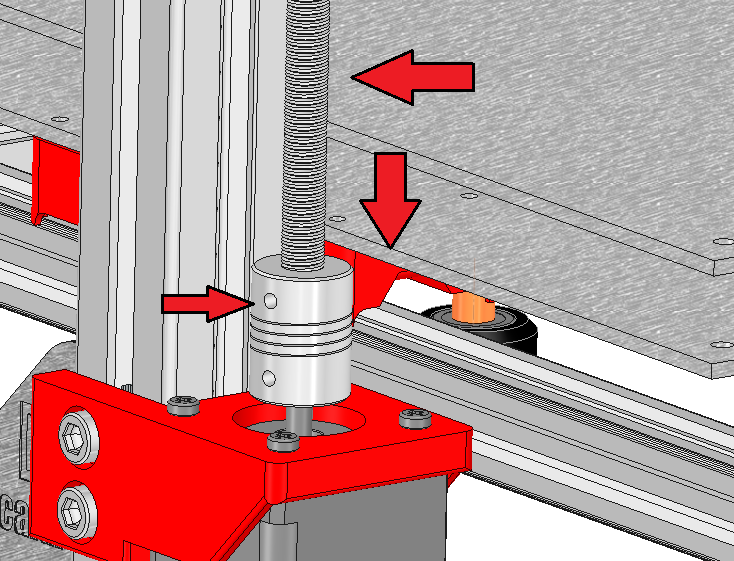 Some special grooves are present for screw heads so that they stay inside the plastic part. make sure to tighten reasonably the wheels. If you overdue this part you might block the wheel bearing . In that case you might need to UN-tighten a little bit. Each wheel must be able to turn freely with no play. 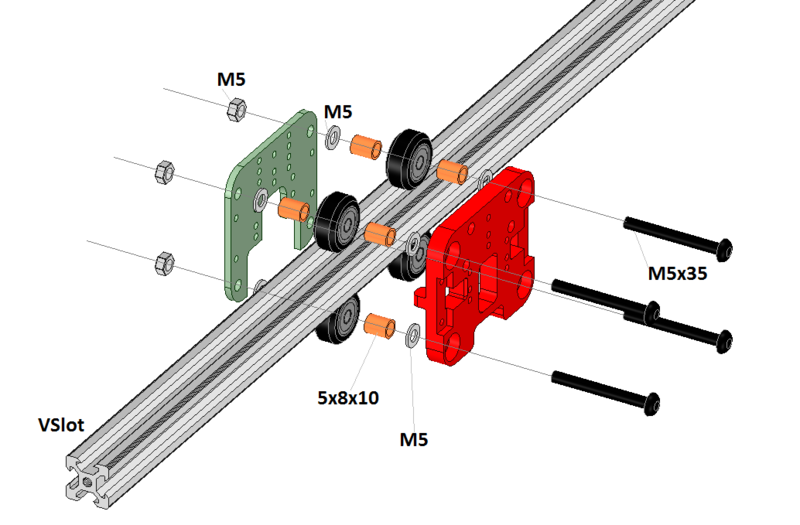 The carriage must be able to roll n the extrusion profile with no play. 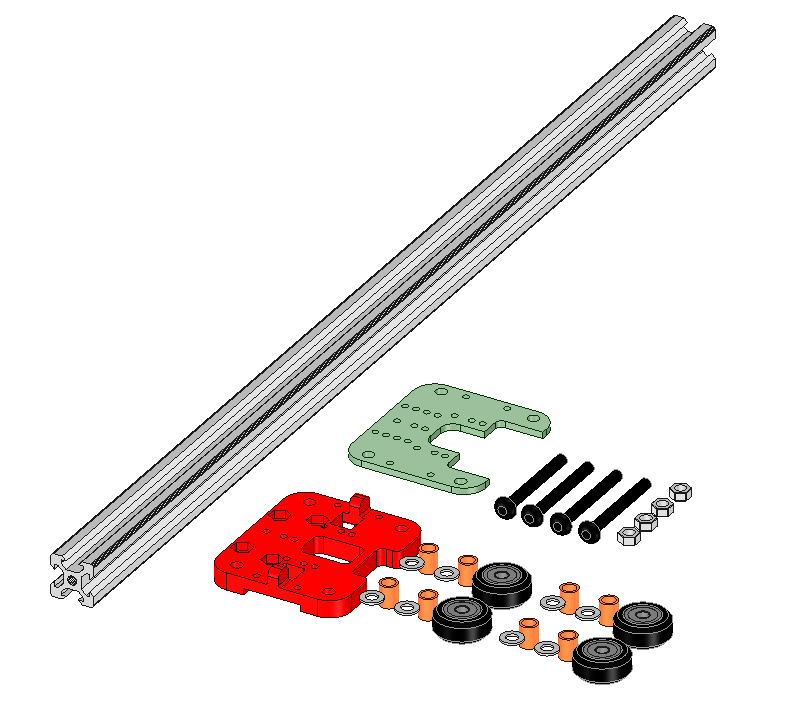 here you have the motor support of the X Axis. The form can change in time but the idea remains the same. 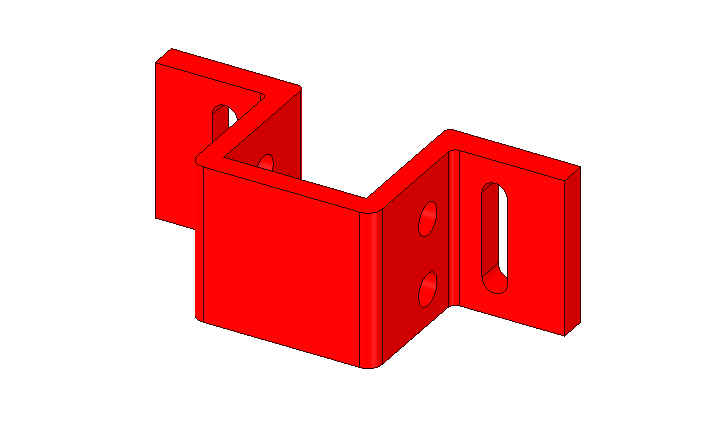 This part is to be placed on the left of the X axis on top of your jaws. 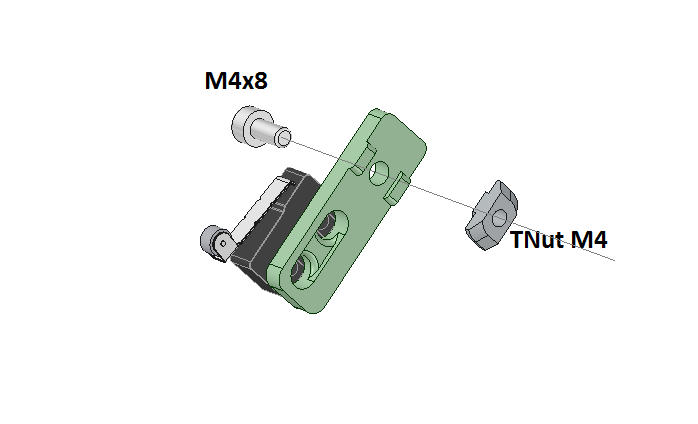 The holes inside the motor holder can hold 3 set of screws. The 2 remaining are available on the edge of the plastic holder. 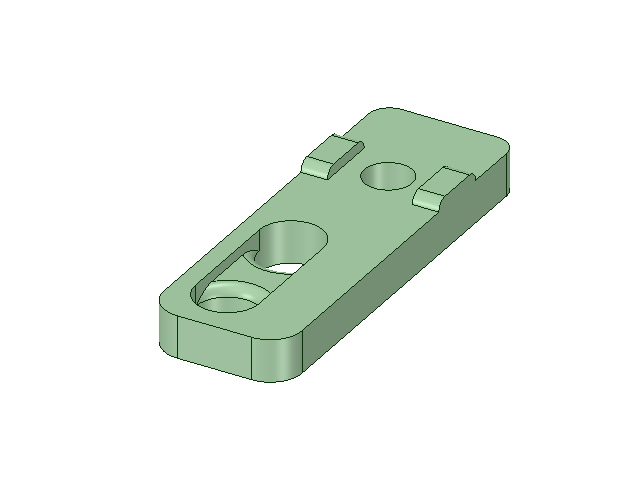 The group of 3 screws in the middle must fit properly inside the plastic part . The head screw of the 2 other screws are supposed to be left outside the plastic part. 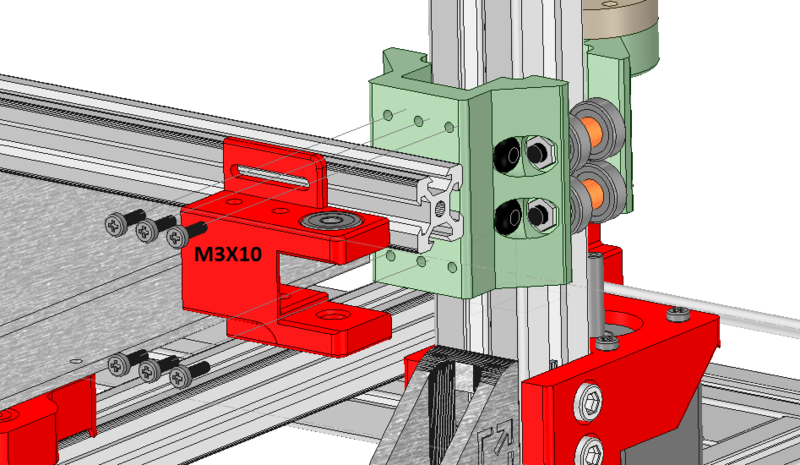 Here is the fixation of the extrusion profile that of the X Axis. 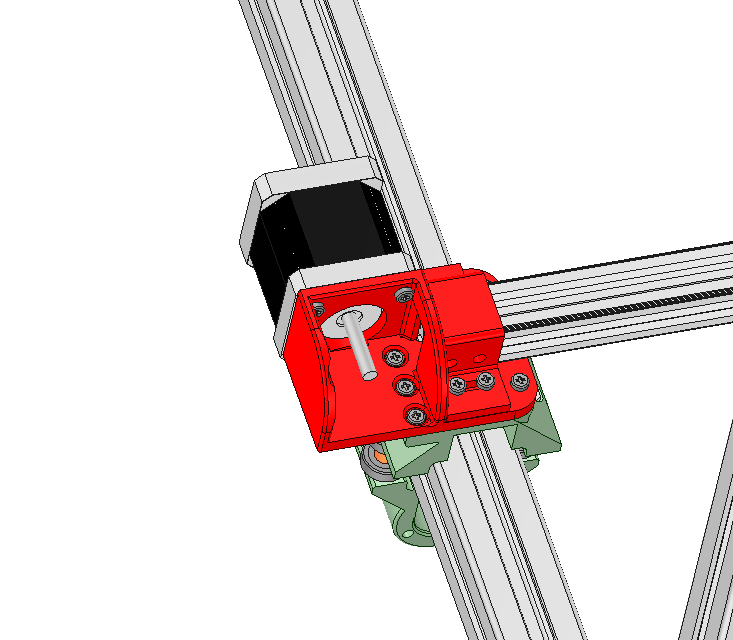 Now you need to place the extrusion profile so that it’s aligned with the motor holder. Afterwards we are going to screw holders on both side of it. 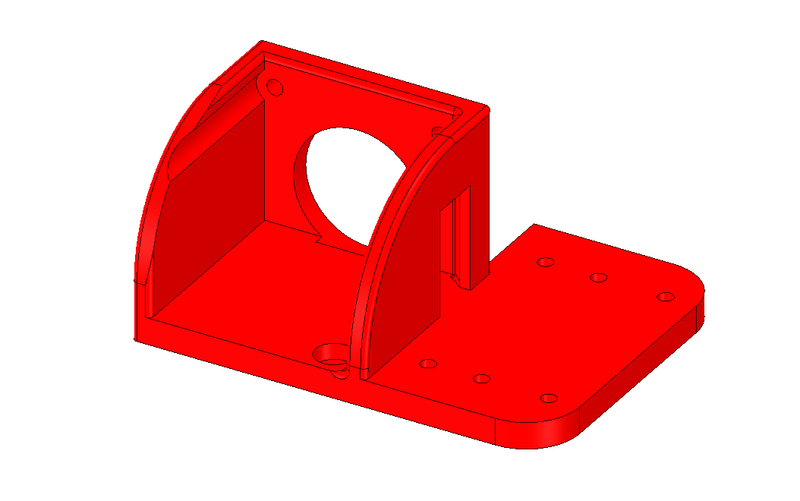 You can use a flat object to be placed below the extrusion profile to help you inserting the holders at both ends. 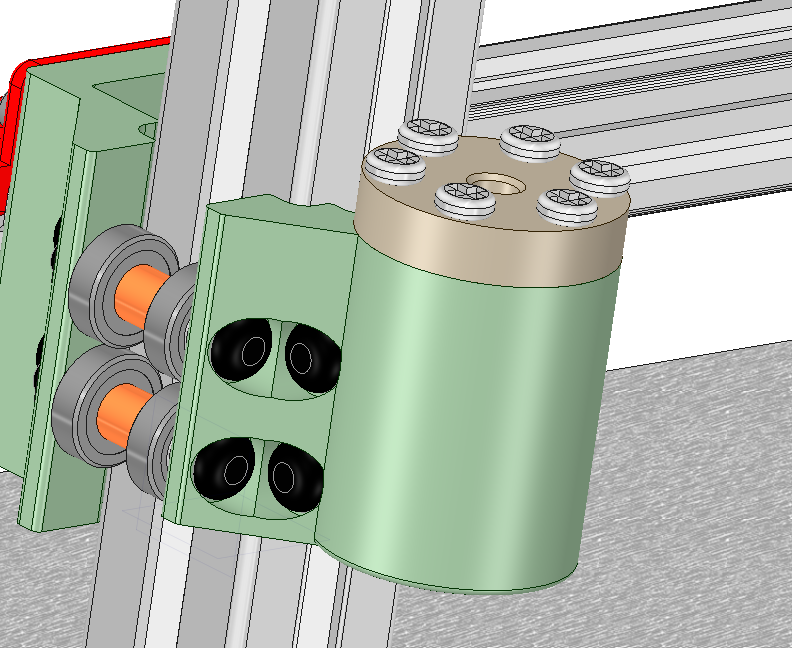 The double rows of 3 holes on the motor holder side is where we are going to fix our first holder. 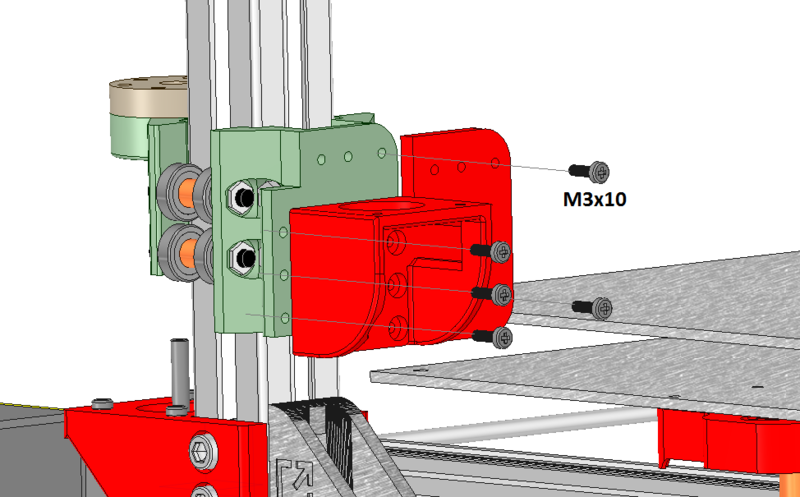 The extrusion profiles il to be aligned between the 2 rows of screw holes. 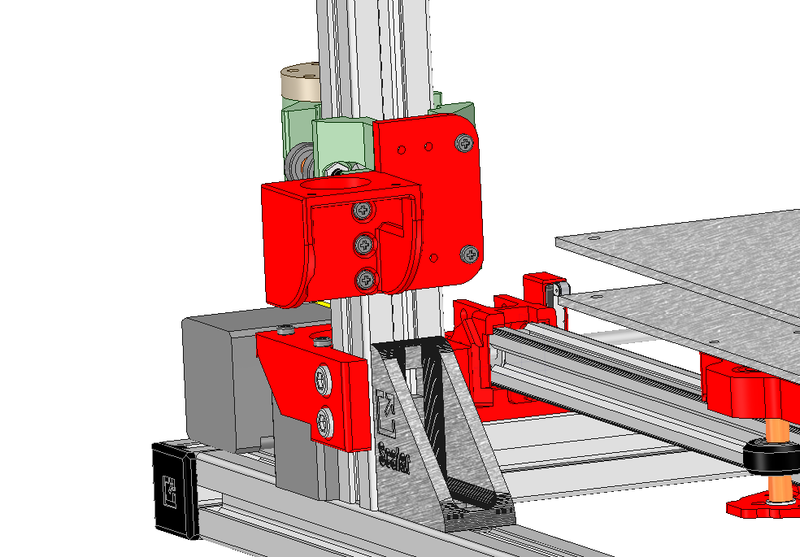 here is another view showing where to place the extrusion profile. 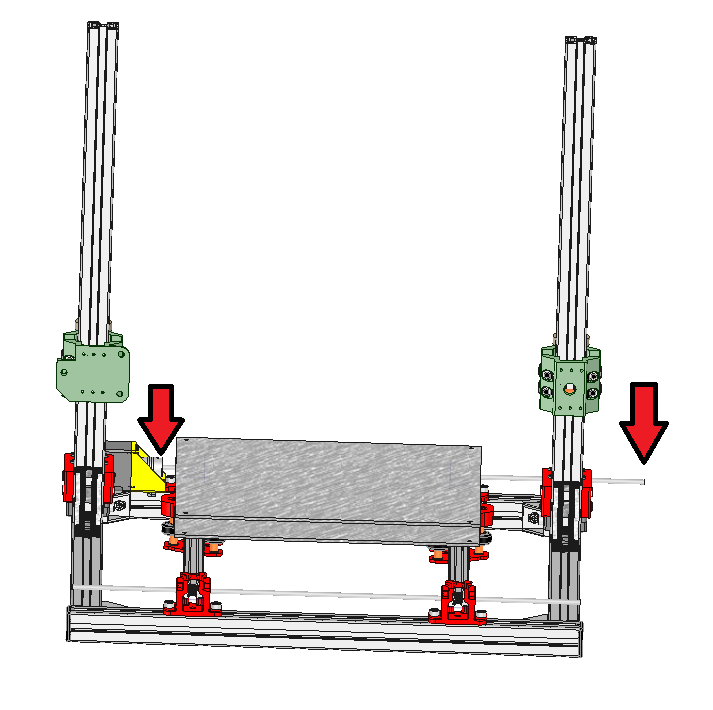 The holding part is placed on top of the extrusion profile as near as possible of the motor. 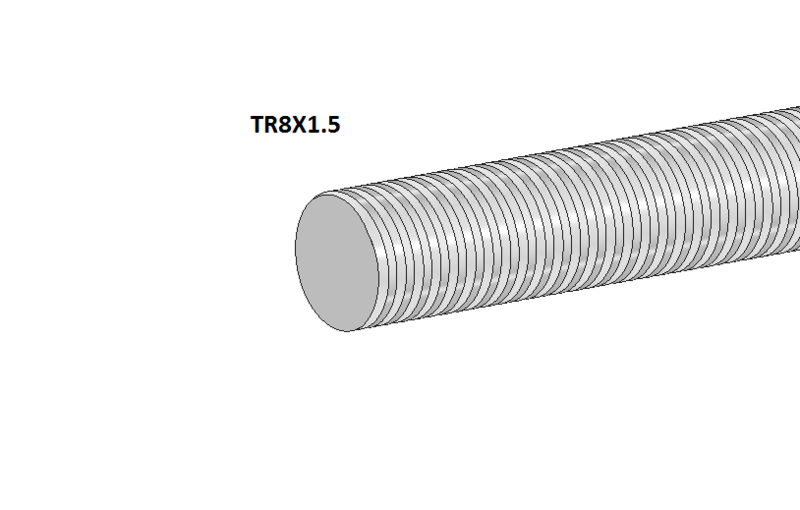 On the other side, it’s very similar, we also align the extrusion profile in the middle of the double set of screw holes. 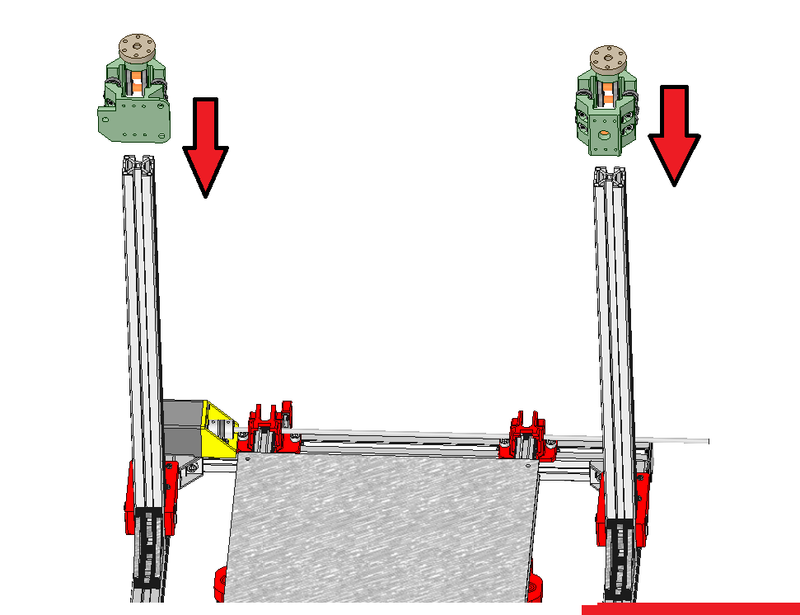 Here is the holding part we are using on the right side. They are to be placed inside the 2 dedicated holes on the side. 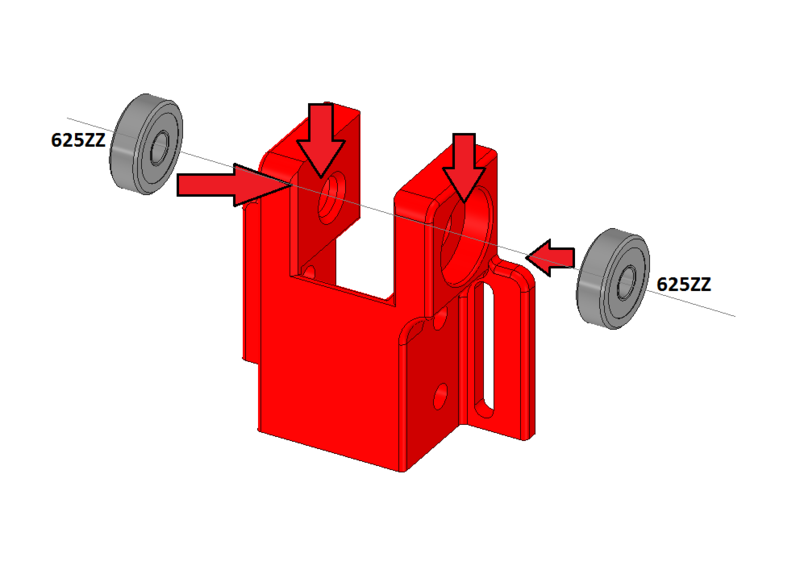 The bearing should hold inside the grooves with no additional screws. 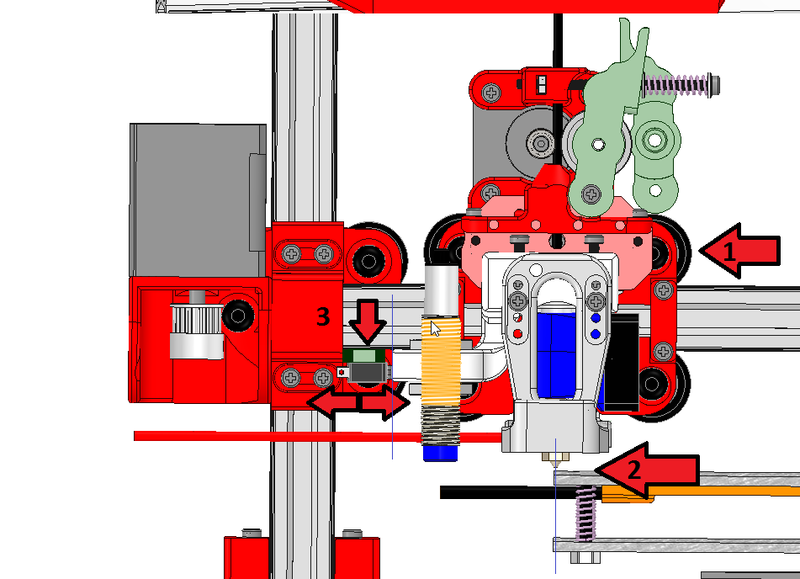 note that the extrusion profile must be fully pressed against the holding part. you will then have some margin to tighten your belt later on. Place each flanged nut inside their dedicated holes at the back of the jaws. 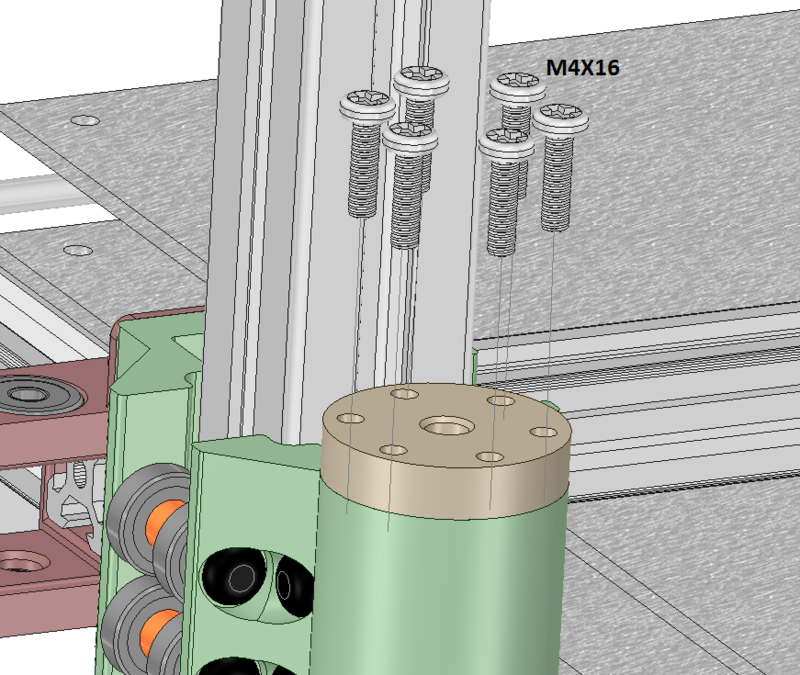 Then use M4x16 to hold them in place. Inside the couplers you should have a cleat. 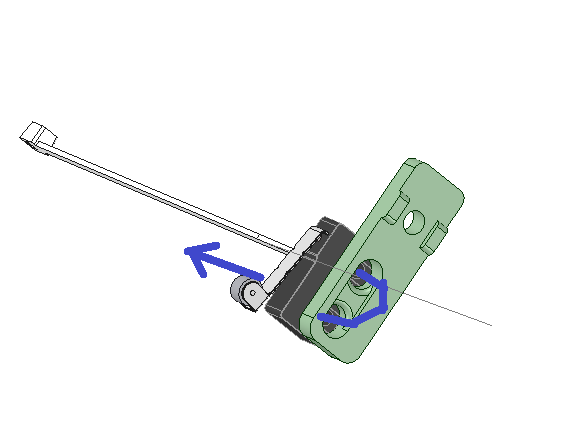 the motor shaft can go up to this cleat. place the motor on top of it’s support. the goal here is to be able to move up the X Axis . 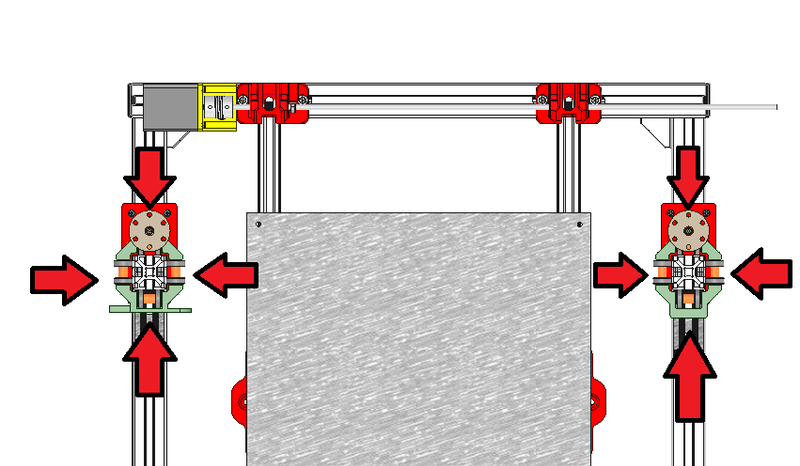 Both Z extrusion profiles will naturally align themselves once the X axis as reached the top. 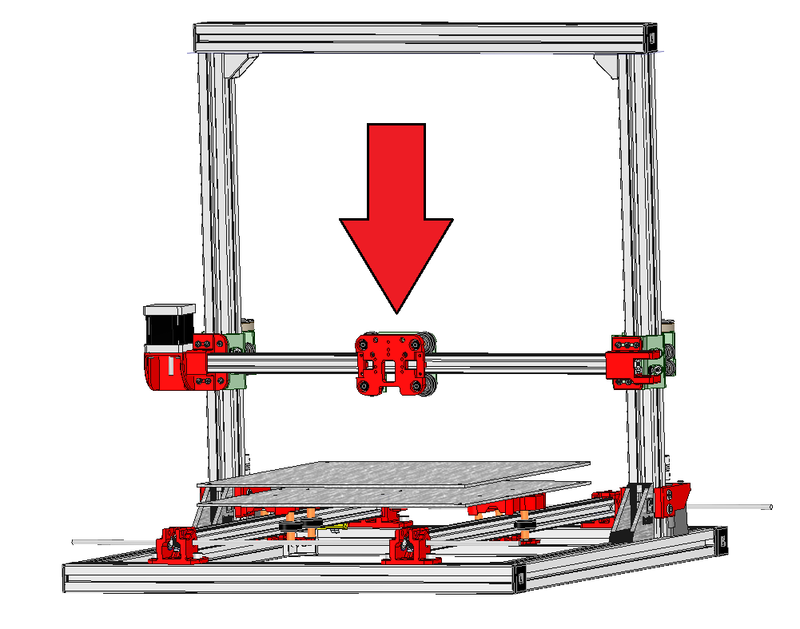 Move up the X Axis. 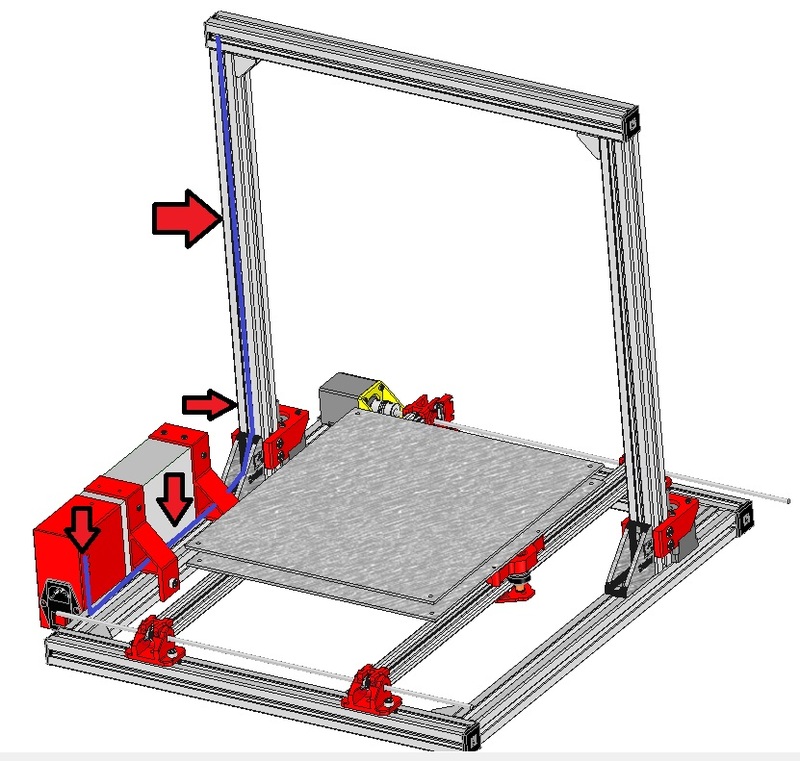 Once on top you can adjust the location of your small squares so that both Z axis extrusion profile stay parallel. 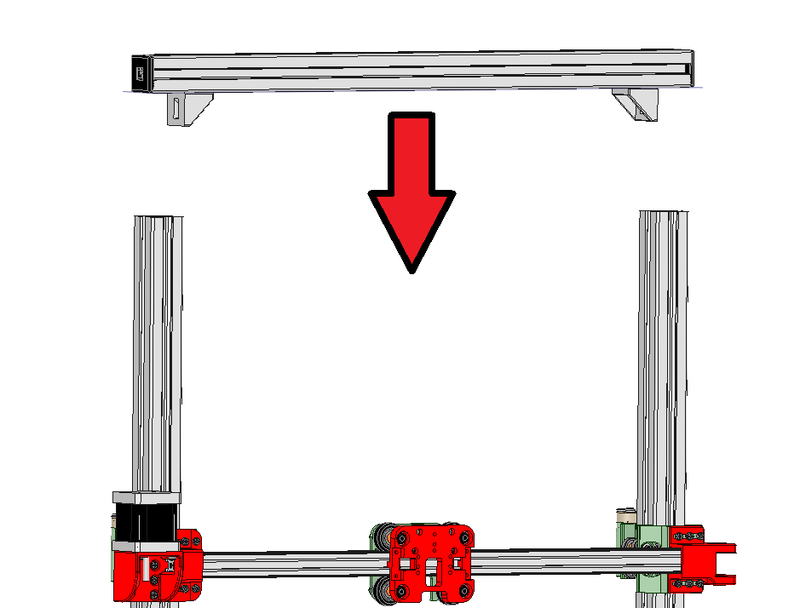 The X Axis must be able to move up and down. 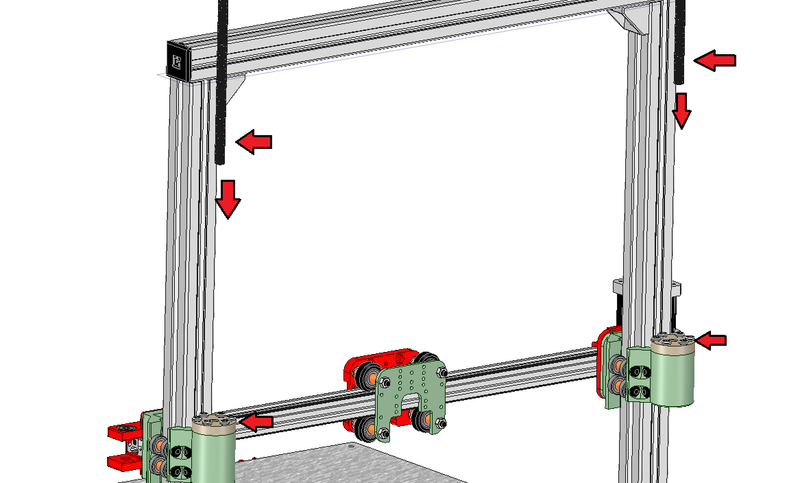 Move down your X Axis in order to check that the movement smooth. 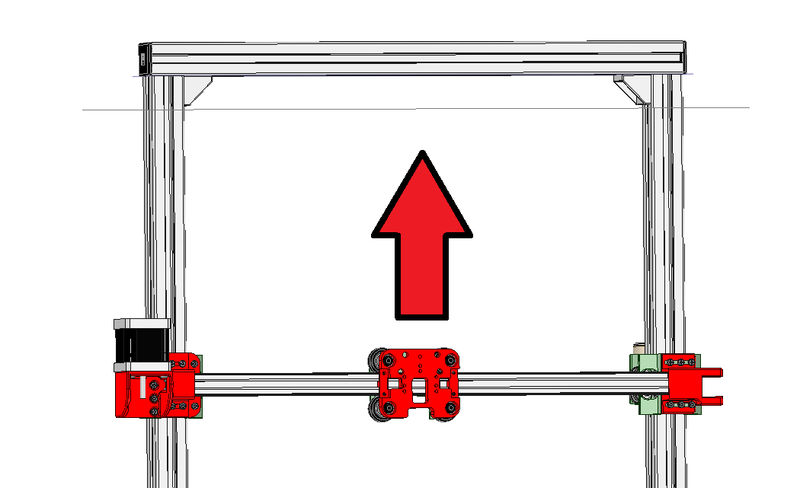 you might need to force a little bit to move the X axis up and down but it’s normal, the lead screw will do the job for you . This also mean that you have very little or no play at all. 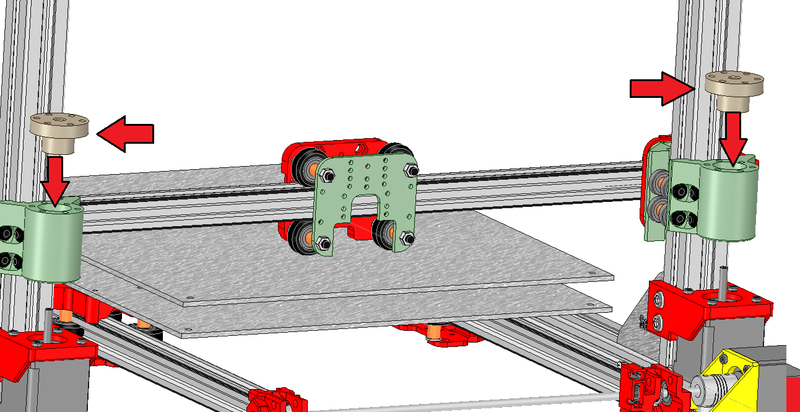 The 2 lead screws are to be inserted by the top of the flanged nuts. Make sure to go smooth when inserting the lead screw. 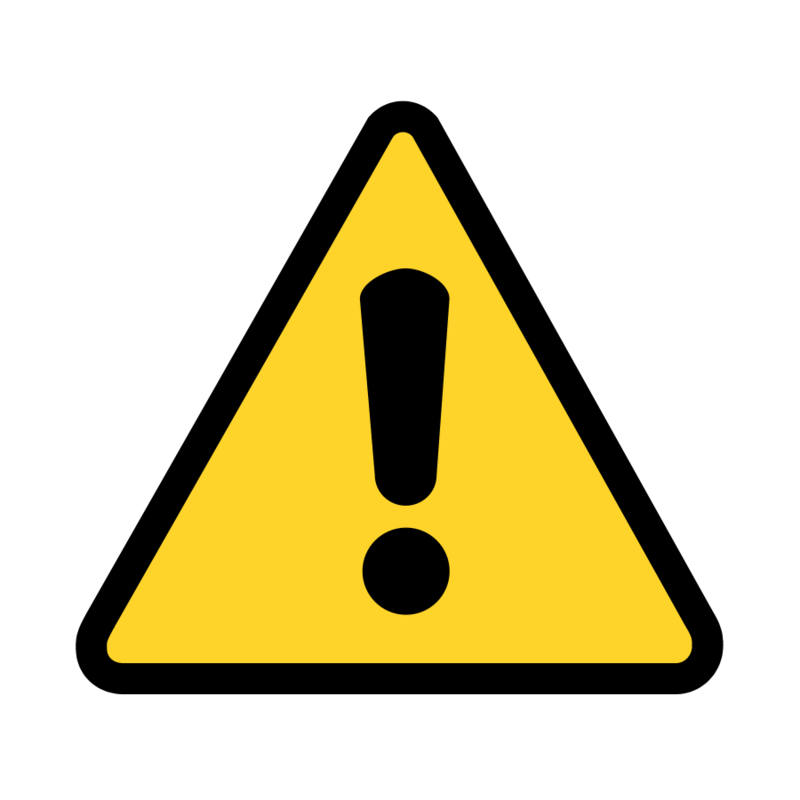 If you encounter some resistance when inserting the lead screw, look carefully at the lead screw thread. The beginning of the thread my be damaged or might require some clean-up. 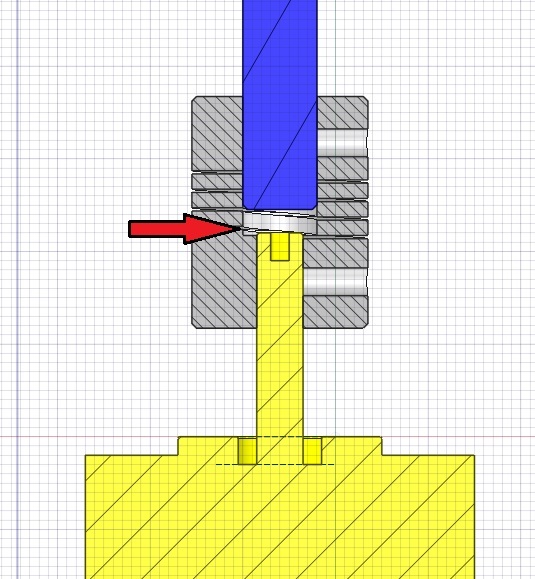 In order to smooth the movement of the Z Axis, to reduce the noise and also in increase the lifespan of your flanged nut, you can use some lubricant on the flanged nut thread. You can use WD40, PTFE lubricant, or even mechanical grease. 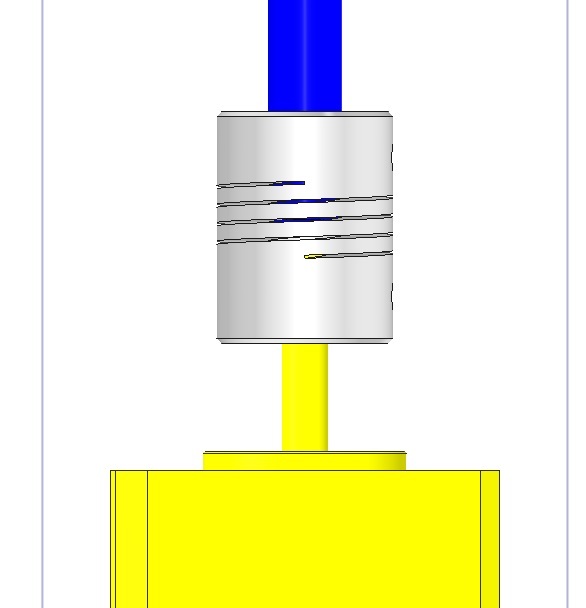 The lead screw is then to be inserted inside the coupler. 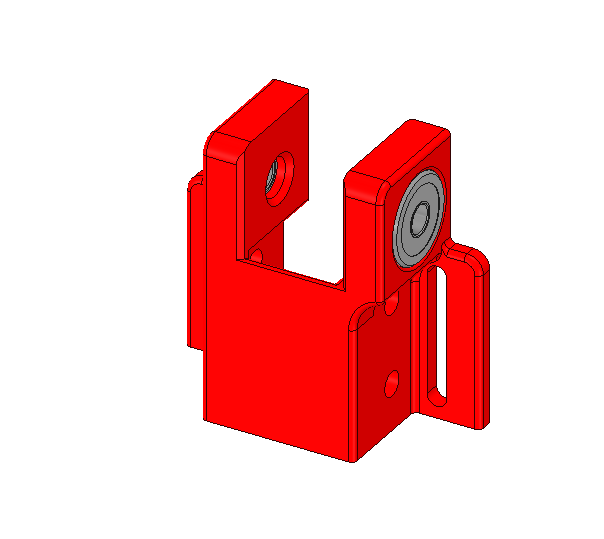 This type of coupler allows to absorb part of the imperfection and alignement issues of the leadscrew. 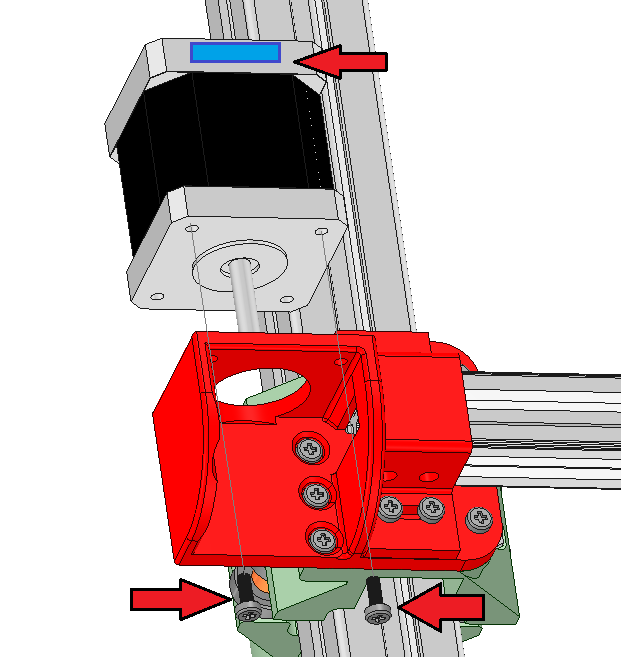 In order for it to work properly, you need to keep a small gap inside the coupler between the motor shaft and the lead screw ending. 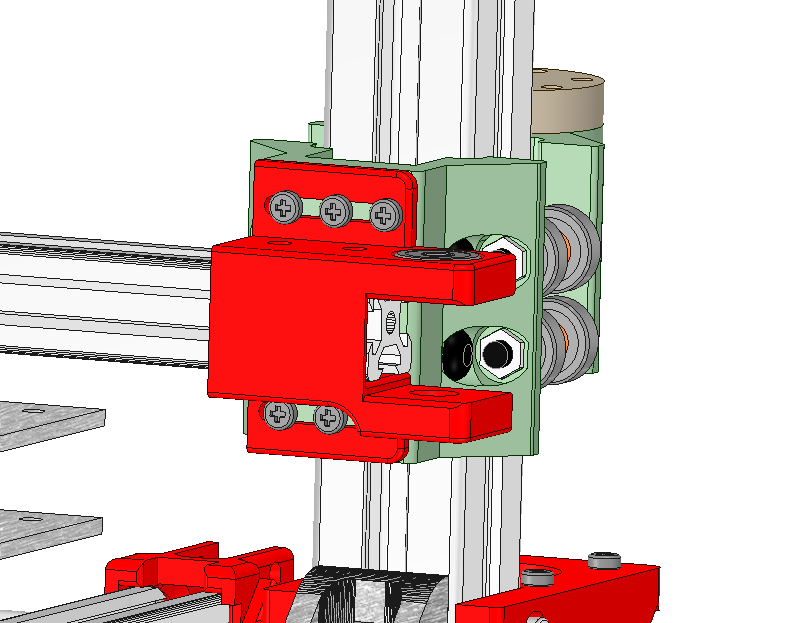 Otherwise the coupler won’t be able to perform properly. 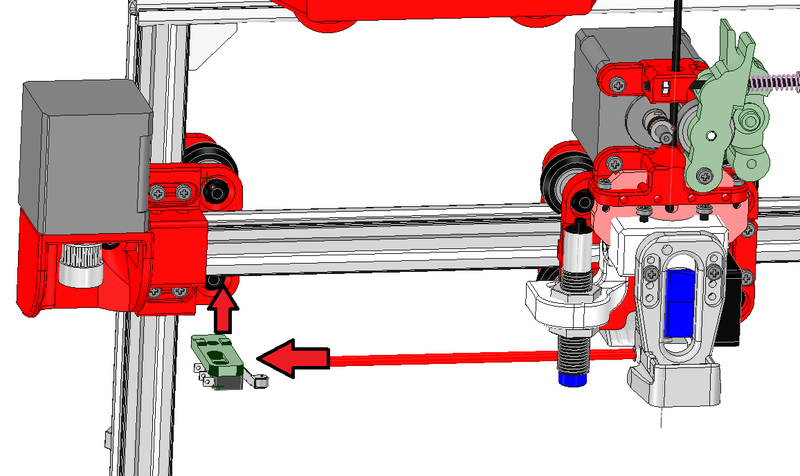 Push the X carriage on the left so that the nozzle (2) is placed at the edge of the heatbed. 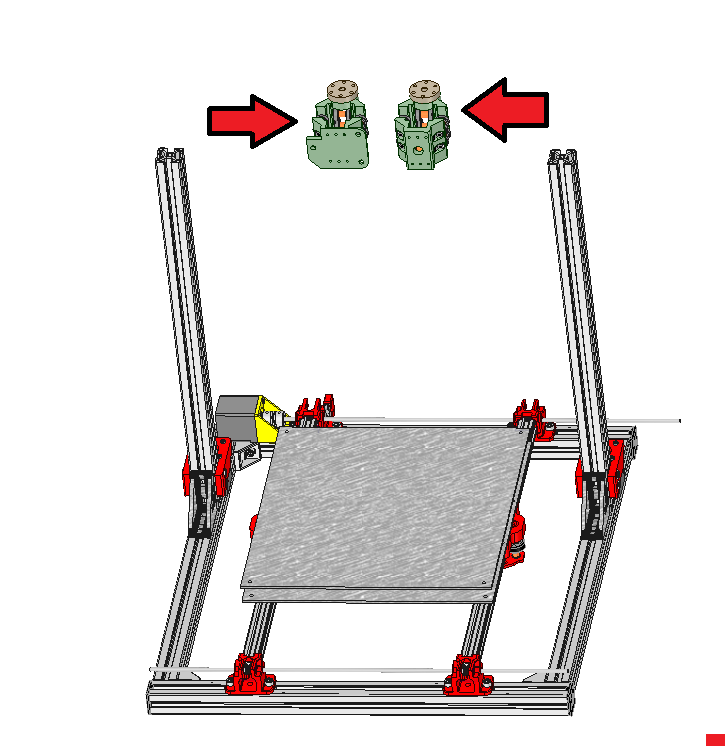 The « Nozzle » must be placed on the edge of the build platform. 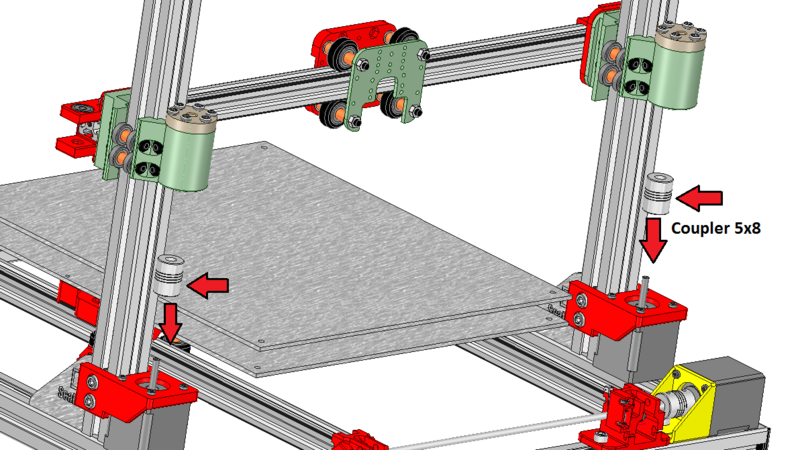 This allows the inductive probe to be centered on the build area when probing. 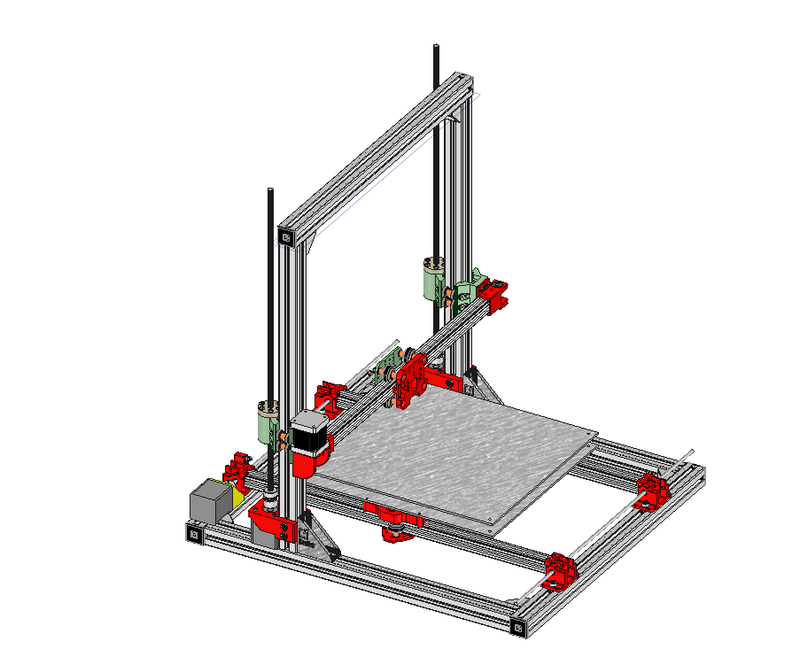 Other potioning will cause the probing to be made outside the print area.